Mayor Michael Bloomberg has been making incremental reductions to New York City’s operating budget since 2008. In eight rounds of cuts, city agencies have been asked repeatedly to do more with less and to sacrifice personnel and programming in order to reduce projected out-year deficits. The story, however, has been very different with the capital budget: despite two rounds of “cuts,” spending commitments are poised to reach an all-time high in fiscal year 2011. 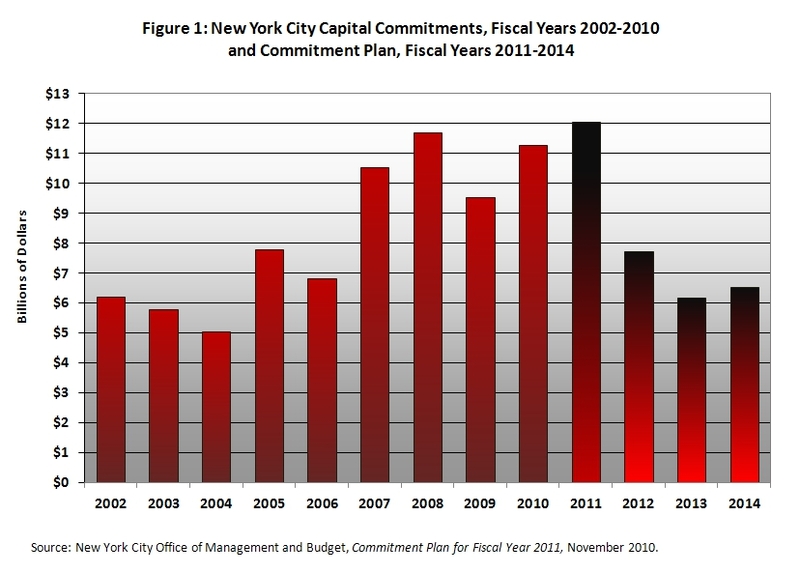 As the graph below shows, the City’s capital commitments increased tremendously in fiscal year 2007. With the City’s economy at its peak, a variety of long-term initiatives to expand and improve the City’s infrastructure were launched. In the wake of the Great Recession of 2008, at least two major reductions to the capital plan were announced; however, planned reductions have not been realized. The first cut to the capital plan was announced in May 2008. The cut left current-year spending undiminished, but reduced the commitment plan for fiscal years 2009-2012 by 20 percent to $38.9 billion. Additional cuts were announced in January 2009, reducing out-year commitments by an additional 30 percent, while leaving 2009 spending intact. The commitment plan for fiscal years 2010-2013 totaled $26.2 billion. Unlike the program to eliminate the gap in the operating budget, which demands immediate and recurring savings, the approach to cutting the capital plan has been to hold the current year harmless and to plan for cuts in the future. But, in the case of the capital plan, cuts that are here today are gone tomorrow, as unfinished work is continuously rolled over to the next year and new projects are added to the infrastructure agenda. The figure below illustrates the failure to rein in commitments for fiscal year 2011. Under the first cut in May 2008, planned commitments in fiscal year 2011 were reduced from $9.2 billion to $8.4 billion. Under the second cut in January 2009, they were further reduced to $6.2 billion; however, the reversal of this reduction began just a few months later in the May 2009 budget proposal. The level of planned commitments continued to grow with each modification of the commitment plan. The most recent plan, released a few weeks ago, shows that 2011 commitments are now projected to exceed $12 billion – a new record high, and almost twice as much as planned in January 2009. Failure to impose fiscal austerity on the infrastructure agenda is evident in growing levels of capital commitments. Since the Mayor began “cutting” the capital plan, average yearly commitments grew to $12.2 billion – 26 percent greater than average yearly commitments between fiscal years 2006 and 2008. (See Table 1.) Spending increased in all service areas, and while there was a slight decrease from peak spending in environmental protection and education, spending on these priorities continued to exceed all others. Average commitments for sanitation, public protection, and economic development more than doubled. Commitments for parks ($1.3 billion), technology and equipment ($1.2 billion) and economic development ($1.1 billion) will reach all-time highs in fiscal year 2011. 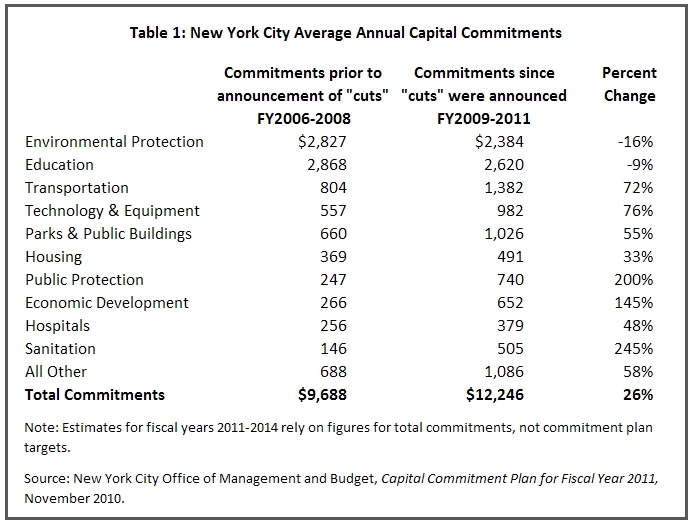 The latest plan forecasts reductions in the level of commitments in the years beyond 2012 (See Figure 1), but the experience of the last few years strongly suggests that spending will ultimately be much higher than currently planned unless the Mayor becomes more determined about establishing priorities in the capital budget the way he has for the operating budget. These figures are based on total commitments for fiscal year 2011. Using the commitment plan targets for fiscal year 2011 does not alter the overall result: total average annual commitments are estimated to be $11 billion for fiscal years 2009-2011, still larger than in period prior to when cuts were announced.